No Googled answers were allowed. From their young lips came wise thoughts and heartfelt responses: “To be a role model,” “To pray for us,” “To love us,” “To give us wisdom,” “To accept us,” “To be proud of us.” My heart was warmed when they also said that a grandparent should tell them about God. 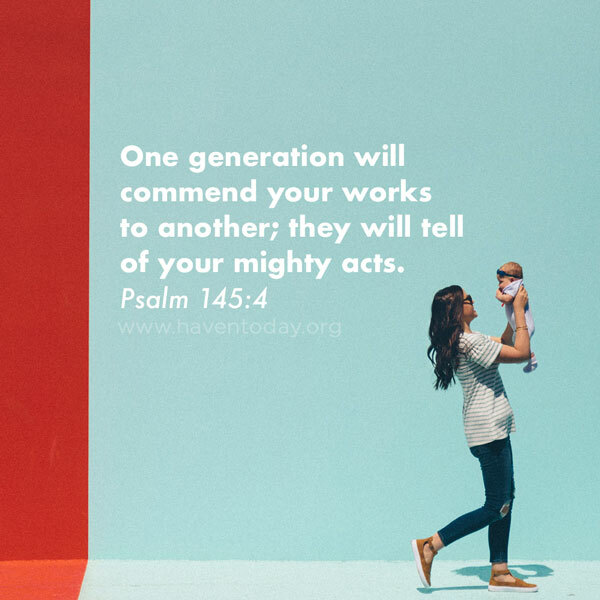 Psalm 145 is filled with words about commending the works of God, telling of His mighty acts and awesome deeds, and celebrating His abundant goodness by passing word of it along to the upcoming generations. Doing so is a responsibility, but also a privilege. Don’t miss any opportunity to recount God’s faithfulness to your children, grandchildren, friends, or any coming behind you.